The Sea Devils are a crack team of independent underwater adventurers who have been known to work closely with the undersea inhabitants of Atlantis. Booster Gold first crossed paths with the Sea Devils when the United States government mistook him for an invading Atlantean during an unnatural crisis in the timestream. Personally responsible for unleashing ECLIPSO on the modern world, Bruce Gordon dedicated his life to atoning for that sin by destroying Eclipso once and for all. To accomplish this task, he formed several teams of heroes with solar-based powers, Eclipso's only weakness. 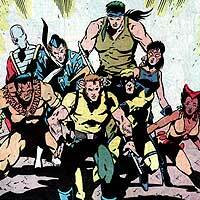 Eventually, these teams would be known as the Shadow Fighters. Booster Gold encountered the Shadow Fighters for the first time when he and the other HEROES UNITED AGAINST ECLIPSO fell under Eclipso's thrall. Though the Shadow Fighters were the best organized of those who opposed Eclipso, other mortals resisted his will as well. This notably includes Jerry Cross, who aided the Justice League in freeing the citizens of Crater Bay (including his wife Carol) from Eclipso's control. 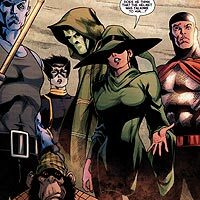 The members of the Shadowpact first assembled to try to prevent the rogue SPECTRE from destroying all magic in the universe. They have remained a team to confront crises of a mystical nature. Though he had previously met Shadowpact members Blue Devil (see HEROES OF ARMAGEDDON 2001), Nightshade (see SUICIDE SQUAD), and Zauriel (see JUSTICE LEAGUE) during his adventures with the Justice League, Booster Gold first encountered the rest of the members of the Shadowpact at the memorial ceremony for the fallen and missing HEROES OF INFINITE CRISIS. After Billy Batson was granted the powers of the ancient wizard Shazam, he eventually shared that power with a number of family and friends. Together, they are collectively known as the Shazam Family. 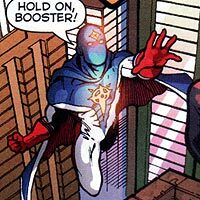 Billy was a teammate of Booster's in the international era of the JUSTICE LEAGUE . 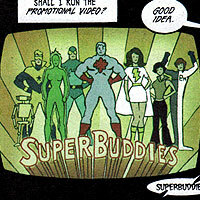 Billy's sister, Mary, was a teammate of Booster's on the SUPER BUDDIES . Booster joined forces with Captain Marvel Jr and the rest of the family during various, world-threatening crises, including the attack on DOCTOR MANHATTAN on Mars. Refusing to concede defeat in the super power arms race with the United States, the Soviet Union aggressively developed its own super powered teams. Among the most notable are the People's Heroes and the armored Rocket Red Brigade. When the JUSTICE LEAGUE received UNITED NATIONS support, a Russian Rocket Red was appointed to safeguard Communist Bloc interests. 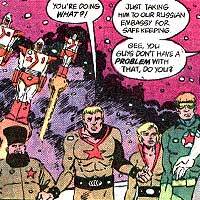 Booster Gold's first encounter with the Rocket Red Brigade is when Rocket Red #7 (Vladimir Mikoyan, secretly an agent for the MANHUNTERS) joins the Justice League, though he will later grow more familiar with Rocket Red #4 (Dimitri Pushkin). 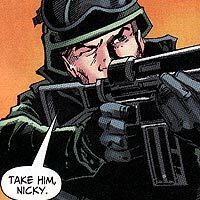 Much later Rocket Red #07 (Gavril Ivanovich), a rogue former Captain of the Rocket Red Brigade, will battle alongside Booster Gold against capitalistic forces within post-Soviet Union Russia, including active members of the Brigade such as Rocket Red #00 (Vadim Benet). Booster encountered the People's Heroes and Red Star during the Justice League's attempt to prevent the SUICIDE SQUAD from rescuing one of their own detained inside a Russian prison. Booster later combats Hammer and Sickle after the two became villains following the collapse of the Soviet Union. During a trip to the 1950s, Booster briefly encounters Sergei Pushkin, a Russian scientist responsible for the earliest versions of the Rocket Red Brigade armor. 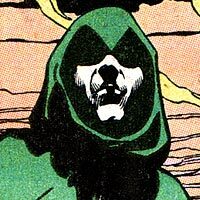 The Spectre is the anthropomorphic personification of the Spirit of Vengeance. It is not always necessary, but the Spectre tends to work best when bonded to a human host. When Booster first worked alongside the Spectre and the HEROES OF THE INVASION against the ALIEN ALLIANCE, the Spectre was bonded with the spirit of slain detective Jim Corrigan. Since that time, the Spectre has passed through other hosts, but has none have yet encountered Booster Gold. When FLASH and Speed Buggy met to race for charity, the grandstands were filled with some of the biggest names in the DC and Hanna Barbera universes. 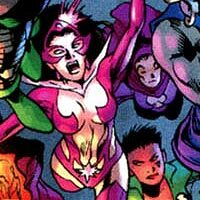 In the past, the Star Sapphire of Zamaron sought to control only Carol Ferris of Earth strictly to oppose her lover Hal Jordan, member of the hated GREEN LANTERN CORPS, but with the coming of the War of the Light, the Zamarons formed an entire Star Sapphire corps to weld the violet light of love. Booster Gold joined the united spectrum of lantern corps (AGENT ORANGE, BLUE LANTERN CORPS, Green Lantern Corps, INDIGO TRIBE, RED LANTERN CORPS, Sinestro Corps [see SINESTRO], and Star Sapphires) in a desperate bid to save all living things from the BLACK LANTERN CORPS. 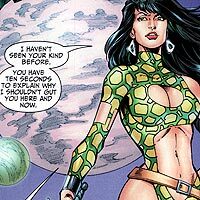 Starfire II is was a slave of the alien Mygorg race in the ancient realm of Pytharia. After reaching maturity, she escaped from the evil King Sookarooth and made it her mission to free the enslaved humans from Mygorg captivity. Following an accident during his search for a time-lost Batman, Booster Gold was transported to Pytharia where he met (and made amorous passes at) Starfire as the pair joined Pytharian native Claw and battled the magical minions of Skyle and her partner Serhattu. Following the apparent death of SUPERMAN, John Henry Irons donned a suit of armor of his own design to carry on the legacy of the Man of Steel as Steel III. Natasha Irons followed in her uncle's footsteps, wearing a suit of armor as Steel IV. Steel III and Booster Gold were among the HEROES OF ZERO HOUR assembled to defend the world against EXTANT. Booster Gold finally met Steel IV during the hectic events of the 52. Task Force X, more commonly known as the Suicide Squad, is a United States shadow-government organization that utilizes imprisoned criminals to accomplish nearly impossible tasks. In recent years oversight for the group is usually handled by bureaucrat AMANDA WALLER. 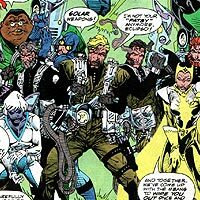 Booster Gold and the UNITED NATIONS sponsored JUSTICE LEAGUE were called by the Soviet Union to intercept the Suicide Squad to prevent the escape of Nemesis, a Suicide Squad member who had been captured on a recent mission. Time-traveling Booster Gold encountered an early 1950s membership of Task Force X including several of the founding members and the renowned war hero Sgt. Frank Rock in his first of several tours with Task Force X. Years after the dissolution of the UNITED NATIONS sponsored JUSTICE LEAGUE that he had struggled to build, MAXWELL LORD reassembled several of the surviving members of his previous team to found a new, for-profit team of super heroes in Queens, New York. This proved to be a disastrous idea, as the team was prone to distractions created by their own foibles, generally causing more problems than they were paid to solve. Booster Gold jumped at the chance to join the Super Buddies, if for no other reason than to avoid his loveless marriage of convenience to his unseen, older, wealthy wife Gladys. The first opponent of the Super Buddies was an astonishingly well educated street gang known as the E Street Bloodsuckers (Jerome, Lawrence, Moses, Samuel). If not for Superman, son of Lara and Jor-El, there would be no Booster Gold. Though that can be said for the genre of the Super Hero in general, it is especially true in the case for Booster Gold. 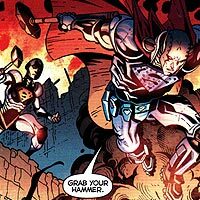 In the 25th century, pariah Michael Jon "Booster" Carter studied the Superman, the legendary hero who had inspired other heroes such as the Kandorian Scorn. In the SPACE MUSEUM, the displays of Superman memorabilia inspired Booster to travel back in time to Superman's era to perform heroic acts while reaping the rewards of fame and glory that Superman shunned. Once in the Metropolis of the past as Booster Gold, Michael most sought the approval of Superman. However, the two heroes were so idealistically opposed, that they developed a rivalry that would lead to multiple physical confrontations. Eventually, Metropolis' devotion to Superman and the high standards that Superman represented would force Booster out of Metropolis. The two heroes met again on multiple occasions, even serving as simultaneously active members of the JUSTICE LEAGUE. Despite the shared adventures, including standing together against the rampaging DOOMSDAY, it remained clear that little had changed in their adversarial relationship. Booster still wanted and needed the approval that Superman remained unwilling to give. 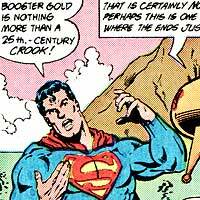 It would be over a decade before Superman finally, if reluctantly, admitted that he accepted that Booster was a real hero, not just a glory-seeking thief. This grudging respect has encouraged Booster Gold to develop and mature into, if not a selfless hero, than at least a more considerate one. 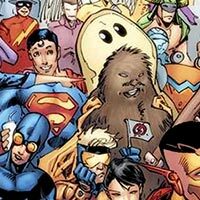 In addition to Superman himself, Booster has often interacted with Superman's extended family, including his cousin from Krypton Supergirl V, his son Jon Kent, his dog Krypto, and many members of his rogues gallery, including LEX LUTHOR, BRAINIAC, General Zod, Zod's wife Ursa, Zod's son Lor-Zod, and the Eradicators. As the war between the GREEN LANTERN CORPS and the Sinestro Corps (see SINESTRO) threatened to envelop the Earth, many of Earth's active heroes united to oppose SUPERMAN PRIME, the villain that had been responsible for so much destruction during the recent Infinite Crisis. 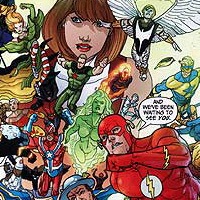 This was Booster Gold's first meeting with many of the new heroes that appeared to defend the New Earth following the events of Infinite Crisis. With SUPERMAN missing, the mysterious new masked hero dubbed Supernova arrives to protect the citizens of Metropolis following the Infinite Crisis. The first appearance of Supernova I coincided with the public revelation that Booster Gold had been falsifying some of his celebrated exploits, and Booster Gold openly blamed Supernova for stealing the public's affection away from him. Later Supernova II (see DANIEL JON CARTER) would assist Booster Gold in saving the nascent multiverse. The third Supernova is a villain with ties to his predecessors (see SUPERNOVA III).